We’d love your help. Let us know what’s wrong with this preview of Esquivel! by Susan Wood. To ask other readers questions about Esquivel!, please sign up. Be the first to ask a question about Esquivel! 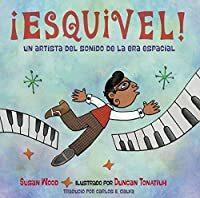 Although Susan Wood's text of this picturebook biography is not the most inspiring (it's not bad at all but it's not exceptional either), it was really interesting to learn about Esquivel!, a Mexican musical innovator and the father of space-age bachelor-pad lounge music popular in 1950s and 1960s, and to listen to his music afterwards. The author's note and resources at the end of the book were especially useful for that. Also, although Duncan Tonatiuh's art style inspired by ancient Mexican art Although Susan Wood's text of this picturebook biography is not the most inspiring (it's not bad at all but it's not exceptional either), it was really interesting to learn about Esquivel!, a Mexican musical innovator and the father of space-age bachelor-pad lounge music popular in 1950s and 1960s, and to listen to his music afterwards. The author's note and resources at the end of the book were especially useful for that. I highly recommend listening to music by Esquivel while reading this book. His music had such an interesting sound and I think it helped enhance the reading experience. Great introduction to the uniquely gifted musician and pioneering sound artist. Energetically told with wonderfully imaginative illustrations by Duncan Tonatiuh. Text-to-self connection: this is similar to the “that’s me” activity that we did at the beginning of class -- there’s a miniature hand raising and celebration of that recognition every time we see ourselves in literature. It occurs when the student or reader sees an element within the book that sparks a memory or reminds them of themselves. This type of connection is exactly what we’re looking for when we talk about culturally responsive teaching. 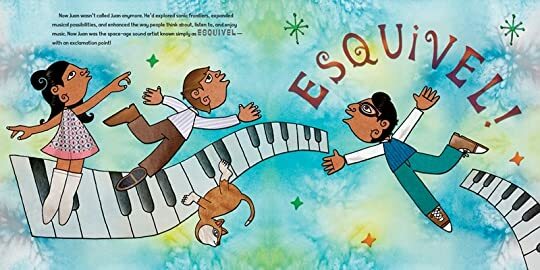 I loved the book Esquivel! and I think I ran into a problem with that; I was too busy enjoying it that I forgot to look for connections! This would be because I related to most everything in this book -- no, I’ve never hit it big on the radio or had to move to another country, but I do love music. The part about young Juan teaching himself to play piano really spoke to me, because I taught myself to sing (which is considerably easier, and most people figure it out, but I was proud of it anyway). I would wander my family’s acreage when I was a child and belt out Disney tunes and Hannah Montana until I was sure I would grow up to be her successor. I also related to the part about the band and having the conductor request strange sounds. I played the flute and piccolo in the Gretna band for seven years, and in my time we’ve clapped, hollered, squealed and hissed and called it music. And then we’d pick up our instruments and do the same! It reminded me of a particular technique called a trill, which was always the favorite of the high woodwinds. Basically, one oscillates between two notes similar in pitch at a very quick rate to create a fluttery, humming sound. I like to think that if I were in the orchestra of Esquivel!, then that’s what I’d do… which is, among the others, an example of a self-to-text connection. Fantastic. The students were so excited to listen to some of Esquivel's music. Esquivel! Space-Age Sound Artist is about the musical career of Juan Garcia Esquivel. The story starts of when Juan was six years old living in Mexico. The book explains how he took to the piano and enjoyed playing it. He had no formal training or didn’t even take classes. He would take different small jobs that would allow him to play his music. People started to take notice of how he “composed/made” music differently than others. He would vision what something would sound like and really use e Esquivel! Space-Age Sound Artist is about the musical career of Juan Garcia Esquivel. The story starts of when Juan was six years old living in Mexico. The book explains how he took to the piano and enjoyed playing it. He had no formal training or didn’t even take classes. He would take different small jobs that would allow him to play his music. People started to take notice of how he “composed/made” music differently than others. He would vision what something would sound like and really use each instrument differently. He soon was asked to come to America in order to share his music with the people there. He kept winning awards and his band even played for 14 years in Las Vegas at the Stardust Hotel. He soon became known as Esquivel! Instead of Juan. The illustrations in this book are done by Duncan Tonatiuh. He brings in bright colors in order to showcase the music Juan is trying to create. I also learned by reading his note at the end that all of his illustrations are inspired by ancient Mexican art. All of his characters are drawn from a profile viewpoint. These illustrations capture the energy and excitement that was Juan when he would create his music. It almost seemed that every page that was portraying Juan creating or thinking about his music the background of the picture would look almost watercolor-like. I found this book because it was the Pura Belpré Award in 2017. This biography is a great focus on an individual's life that will offer readers an insight into historical times and just how Juan become to be known as Esquivel! I would recommend this book for students in grades 2-6. It could be a great book to use when doing biographies on different people. This is a great book to help students learn about musicians or famous people from other parts of the world. I know everyone loves them, but I just can't get into Tonatiuh's illustrations. This is an interesting book, but I'm not sure it's going to circ all that much. It is always exciting to add another "famous people" in muticultural contexts. Cesar Chevaz has been nearly only Mexican icon known in the mainstream of the U.S. Juan Garcia Esquivel is a music artist who influenced Mexico TV and popping fields. The story is written with dynamical and rich language arts perspectives. Duncan Tonatiuh's illustration is as charming as usual! Summary: This book is a non-fiction story about Juan Garcia Esquivel. Esquivel! (with an exclamation point) was born in Mexico and fell in love with music. He began exploring and getting familiar with music since the age of 6. He eventually became so popular in the music industry that he came to the US and was able to share his unique music with a bigger audience. Evaluation: Duncan has become one of my favorite authors and illustrators. In this book, he is only the illustrator. I love how he bri Summary: This book is a non-fiction story about Juan Garcia Esquivel. Esquivel! (with an exclamation point) was born in Mexico and fell in love with music. He began exploring and getting familiar with music since the age of 6. He eventually became so popular in the music industry that he came to the US and was able to share his unique music with a bigger audience. Evaluation: Duncan has become one of my favorite authors and illustrators. In this book, he is only the illustrator. I love how he brings the story to life for me with the pictures and drawings. One of my favorite pages was the one where the words are literally coming off the screen as Esquivel! is conducting. Great read! This is an exciting biography of an innovative musician. In addition to the textual narrative that leads us eagerly through his musical career and technological-and-aural discoveries, the illustrative use of sound-related text punctuates the story with excitement. Tonatiuh's Mixtec codex-inspired illustrations are a fabulous pairing that complements the story's futuristic bent, combining traditional caricature with modern figurature and electronically-enhanced collaging from textures and photos. This is an exciting biography of an innovative musician. In addition to the textual narrative that leads us eagerly through his musical career and technological-and-aural discoveries, the illustrative use of sound-related text punctuates the story with excitement. Tonatiuh's Mixtec codex-inspired illustrations are a fabulous pairing that complements the story's futuristic bent, combining traditional caricature with modern figurature and electronically-enhanced collaging from textures and photos. "Esquivel! Space-Age Sound Artist" is a book about the life of Esquivel! and how he grew to be famous for his music. Juan Esquivel lived in Mexico for much of his life. He never had any formal education on music, but could always be found at a piano. Due to his lack of education, Juan was unable to read notes. Instead, he based his music on sounds. This is what would eventually make his music so famous and intriguing. In a classroom, this book can most definitely be used in a music class. There "Esquivel! Space-Age Sound Artist" is a book about the life of Esquivel! and how he grew to be famous for his music. Juan Esquivel lived in Mexico for much of his life. He never had any formal education on music, but could always be found at a piano. Due to his lack of education, Juan was unable to read notes. Instead, he based his music on sounds. This is what would eventually make his music so famous and intriguing. This is too long for storytime. I really enjoyed this book. It was really cool to see how the author described the sounds each instrument made and the sounds some of the singers in the book made. I also really loved the colorful illustrations on the pages where Juan thought in color about his music. I think this book would be great for a classroom where there is a child who may have a passion for music and also may be a different ethnicity than the other students in his classroom. Juan used his roots to guide his music and tha I really enjoyed this book. It was really cool to see how the author described the sounds each instrument made and the sounds some of the singers in the book made. I also really loved the colorful illustrations on the pages where Juan thought in color about his music. I think this book would be great for a classroom where there is a child who may have a passion for music and also may be a different ethnicity than the other students in his classroom. Juan used his roots to guide his music and that led him to America just like some of the children in our future classrooms. Esquivel! 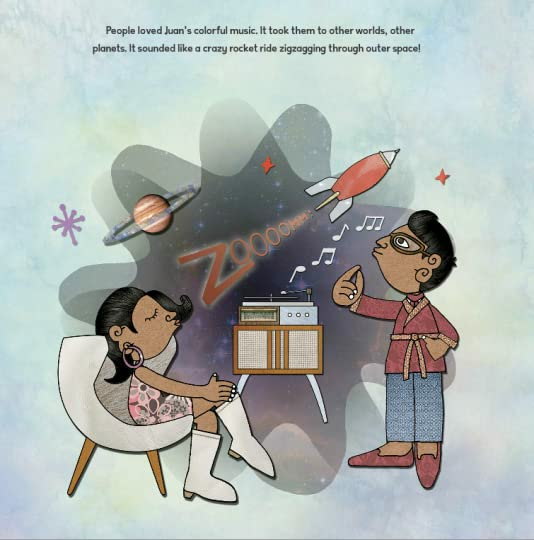 Space-Age Sound Artist was written by Susan Wood and illustrated by Duncan Tonatiuh. This story is a biography about Juan García Esquivel and his passion for music. It starts out with his enjoyment for the mariachi bands in Tampico, Mexico. The illustrations of this story go right along with the life of Juan García Esquivel. This is a good book to read to students when learning about famous musicians. Overall this was a great biography and children would enjoy reading it. Fascinating life story, a self-taught Mexican musician who led a radio comedy orchestra at age 17, and experimented with musical sound, eventually led to American record contract. He used the then-new technique of stereo, had singers singing sounds instead of words, and came up with all kinds of unique compositions. He reinvented traditional Mexican music in new ways, using unusual instruments and tempos. I picked up and read this book because Duncan Tonatiuh is the illustrator. Then I became fascinated by the subject matter, Juan Garcia Esquivel, a brilliant, self taught, pianist, and orchestra leader. When I first started reading I was reminded of the work by Celso Machado, a local jazz musician, who creates music from whatever is at hand. I appreciated the notes from the author and illustrator at the end. After finishing the book I went to Spotify and started listening. Just WOW! For those kids who love unique non-fiction books, Esquivel: Space-age Sound Artist by Susan Wood might be just the ticket for something new to explore. Esquivel was a musician from Mexico who pushed the boundaries of what music is and incorporated many new sounds and instruments into his compositions. Illustrator Duncan Tonatiuh's stylized drawings set the mood for this jump back in time to the 1950's and 1960's. For ages 5 - 10. By itself, as a nonfiction about a now relatively unknown musician, this book is very interesting. For those studying music or Latino artists, this would be a good starting point. There is some use of alliteration to help students understand the use of sound. However, I think this book would be much more effective with samples of Esquivel's (Esquivel!'s?) music to bring it to life. This is a fun book! 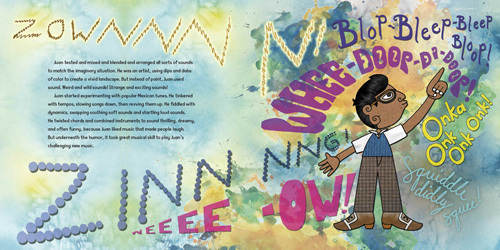 Tonatiuh works to mimic the exciting soundplay of Esquivel's music with brightly colored illustrations that include lots of sound effects and unusual movement around the page. Without having heard a single song, readers get the idea that this music is upbeat and kind of wild. Esquivel was a real protege and he has an interesting story. Listening to the narration of this book on CD, with Esquivel! 's music in the background is fabulous! The author & illustrator did a good job describing some of the exotic instruments he used, but still, merely reading the text doesn't convey the beauty of his music. It must be listened to while absorbing the illustrations at the same time! Ages 6-10. I didn't really enjoy this story very much at all because I didn't think it was all that interesting or inspiring at all. Another thing that didn't really wow me about this book was the illustrations. I thought they were very dull and could of been better. The story wasn't horrible but it was definitely not the best I've ever read. Probably wouldn't recommend this story to anyone. Esquivel! Now I need to go and listen to his music! I love the illustrations in this book, they made me laugh out loud with joy! Composing music in the style of Esquivel! would be a lot of fun with a group of kids.